you move people, you will move business! The bottom line is important, but if you detach from this burden while you are creating relationships, you will find that the health of your bottom line will improve on its own! The term - heart led or heart centered - seems to be a catch phrase that is becoming more prevalent in both the written word and at motivational conferences. 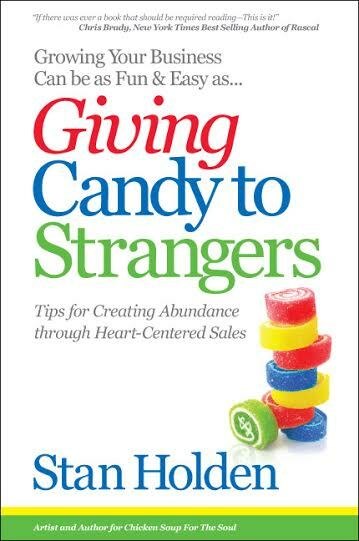 As it's one I fully embrace, I cracked open Giving Candy to Strangers with great excitement, ready to hear this author's contribution to the subject and it didn't disappoint. There are several notes I would like to make. First, a lot of truths are shared here. As they are shared, I suspect you, like me, will realize you actually already know them deep in your core. The rat race the business world encourages us to embrace looks at numbers only. How many sales? How much earned? This has caused us to push the idea of building relationships to the side. It's time to embrace building strong personal connections again. Next, the author's decision to offer an easy to read writing style and super short chapters is perfect in today's busy world. Readers can absorb each lesson one small sound byte at a time and take the time needed to incorporate it before moving on. Lastly, the author offers simple ways for natural introverts or those shy in social situations to dip their toe into how to feel comfortable talking with strangers and building new relationships. I suggest you have an underliner ready when you read this one. It's not for the BIG strategies you will read, it's for the many simple concepts that will hit you between the eyes each chapter - and there are many. Kudos to the author on offering a great angle on building your business that can be applied to other areas of your life as well. I will be reading it a second time, marker in hand. For a fab behind the scenes interview with the author click HERE!